What’s most fascinating about Otaki is its diversity of residents. Someone suggested that we had a famous illustrator of children’s books living in our street. Inquiries confirmed that it was Trevor Pye who had recently finished a successful exhibition at the Mahara Gallery, and another in Wellington, so I dropped by to find out more. Trevor Pye has over 200 books to his credit. He’s illustrated for such names as Joy Cowley, Jenny Hessell and Roger Hall and over 20 other writers of children’s books. His best known works are the Grandma McGarvey series that began in 1990 and still going strong after 25 years. The twelfth edition is Grandma McGarvey’s Christmas, 32 pages of bright bold images for three to seven year olds. The Grandma McGarvey series, still in print have sold over 100,000 books worldwide in Australia and NZ. Trevor was born in Te Awamutu, went to school in Taranaki and sought his fortune in Australia, with a wife and two children. In Adelaide he enrolled in an art night class. The tutor was an ex-pat kiwi. He liked the work Trevor did. He thought he could do better than dig graves, and talked to some connections at Channel 9. Trevor began working on TV, sets picking up props and set construction. This lead to freelance work as an artist on a children’s show Here’s Humphrey the Bear, where he realised that he could earn money as a freelance artist. With his nascent talent confirmed, he undertook a four year Fine Arts degree in Adelaide, teaching art part-time, while the family increased to four children. Back in New Zealand in his thirties, with a Fine Arts degree and his marriage over, Trevor got a job at the Auckland Institute of Technology. Polytechnics were in the process of offering degree courses, and Trevor’s qualifications appealed. He enjoyed teaching, had good rapport with his students and was encouraged to develop the curriculum. These were exciting times which continued for a decade, during which he completed a Masters degree at Elam, University of Auckland with First Class honours, and developed courses in Contextual Studies, marrying artistic theory and practice. Like all good things, it came to an end, with a change in educational philosophy. When Trevor learned that his students were now to be called ‘clients’, he became disillusioned and resigned. Leaving academia gave him the chance to find out whether he could exist as an illustrator and as an artist. “What’s an illustrator?”, I asked. One who gives visual reality to what an author writes, while also adding visual subtexts and richness was the considered response. For Trevor, the process generally takes two to three months, from discussions with the author and publisher to delivery of the final artwork. 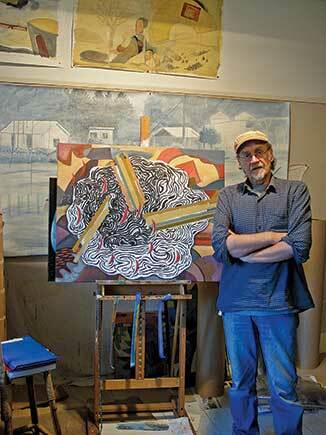 He works in his studio at home, amongst several works in progress, a multitude of easels and paraphernalia. On leaving teaching, Trevor moved to the Bay of Plenty, where he remarried and developed his career both as an illustrator of children’s books, and pursued artistic development as a painter and sculptor. After ten years, Tauranga had lost its appeal, and Trevor and partner Cherry rented out the house and bought a motorhome, to travel New Zealand on an extended eighteen month road trip, looking for the ideal place to settle. Kapiti looked better than most. Estate Agents, when showing him properties at Paekakariki assured him that this was the right place for him: ‘lots of lesbians and artists’, he was assured. Otaki got the nod, and they’ve been enjoying our town for the past 30 months. Trevor Pye’s studio boasts work of many genres, media, styles and subjects: landscapes and portraits, realistic and abstract. Media include charcoal, watercolour and acrylic on paper, canvas and wood. His works sell from big hundreds to small thousands of dollars. 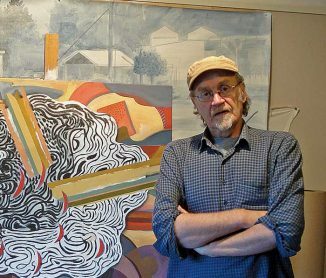 He has exhibited all over New Zealand, and has works in galleries and collections all over the world (even such obscure places as The House of Humour and Satire, Gabrovo, Bulgaria). 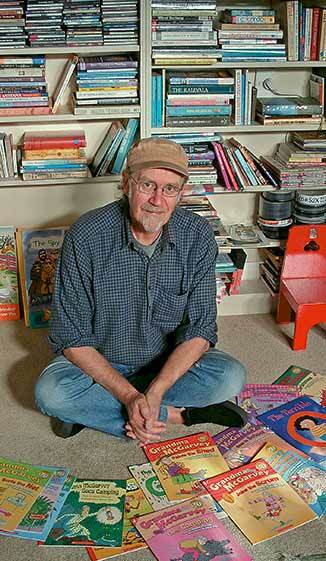 His websites, www.trevorpye.com and www.trevorpyepicturebooks.com contain a good representation of his diverse talents.